American military communications satellite. 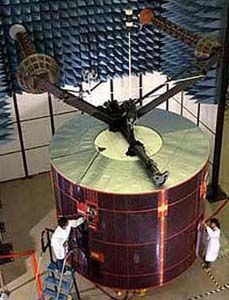 The Leasat HS 381 series was developed as a commercial venture to provide dedicated communications services to the U. S. military. Status: Operational 1984. First Launch: 1984-08-30. Last Launch: 1985-08-27. Number: 4 . Gross mass: 1,330 kg (2,930 lb). Height: 2.70 m (8.80 ft). Owned by Hughes Communications, the satellites were designed to provide global UHF communications to military air, sea, and ground forces. The Leasat program was initiated as a result of Congressional reviews in 1976 and 1977 which advised increased use of leased commercial facilities. The system's primary user was the US Navy, with some support also provided to the Air Force and ground mobile forces (using FLTSATCOM terminals). Hughes was paid $ 84M per year for each operational satellite. At the end of each satellites' designed 7 year life, the Navy had the option of purchasing the satellite for $15M. 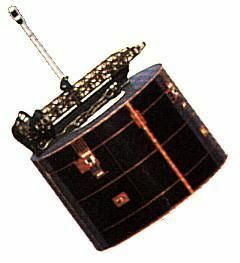 The Leasats, along with the Navy's FLTSATCOM spacecraft, were later replaced by the UFO (UHF Follow-on) spacecraft. The spacecraft used a Hughes HS-381 bus, spin stabilized at 30 rpm with despun communications and antenna section. Body mounted solar cells provided 1500 W BOL and NiCd batteries provided power in eclipse. A solid rocket motor was used for perigee burn, and a bipropellant system for apogee burn. A hydrazine system was used for station-keeping. The design was optimized for Shuttle launch and deployment. The payload included five antennas on the despun platform, which provided full Earth coverage. These included two UHF helices (30 cm diameter, 3.8 m long) were fitted, one for one transmit, one for receive; two X-Band horns (one beacon, one receive); and one omni TT&C antenna. Channel 1 was used for X-Band uplink, UHF downlink, 25 kHz bandwidth for fleet broadcast using spread-spectrum anti-jamming protection. Channel 2 was UHF, with 500 kHz bandwidth. Channels 3 to 8 were UHF, 25 kHz bandwidth. Channels 9 to 13 were UHF, 5 kHz bandwidth. Family: Communications, Geosynchronous orbit, Military communications sat. Country: USA. Engines: R-4D. Launch Vehicles: Space Shuttle. Launch Sites: Cape Canaveral, Cape Canaveral LC39A. Agency: USN, USAF, Hughes. Bibliography: 2, 279, 6. Syncom IV-2 - . Payload: Discovery F1 / SBS 4 [PAM-D] / Telstar 302 [PAM-D]. Mass: 1,315 kg (2,899 lb). Nation: USA. Agency: HCI. Class: Communications. Type: Civilian communications satellite. Spacecraft: HS 381. Completed Operations Date: 1996-10-10 . USAF Sat Cat: 15236 . COSPAR: 1984-093C. Apogee: 36,741 km (22,829 mi). Perigee: 36,448 km (22,647 mi). Inclination: 13.00 deg. Period: 1,477.60 min. Released from STS 41D 8/31/84; 105 deg W; leased to U.S. government. Spacecraft engaged in practical applications and uses of space technology such as weather or communication (US Cat C). Positioned in geosynchronous orbit at 105 deg W in 1984-1987; 177 deg W in 1987; 72 deg E in 1988-1990; 177 deg W in 1990-1996 As of 1 September 2001 located at 17.02 deg W drifting at 10.139 deg W per day. As of 2007 Mar 10 located at 57.99E drifting at 10.147W degrees per day. Syncom IV-1 - . Payload: Discovery F2 / Anik D2 / Syncom-4 1. Mass: 1,315 kg (2,899 lb). Nation: USA. Agency: HCI. Class: Communications. Type: Civilian communications satellite. Spacecraft: HS 381. Completed Operations Date: 1992-09-26 . USAF Sat Cat: 15384 . COSPAR: 1984-113C. Apogee: 36,403 km (22,619 mi). Perigee: 36,152 km (22,463 mi). Inclination: 7.60 deg. Period: 1,461.20 min. Released from STS 51A 10 November 1984; 105 deg W; leased to U.S. government. Spacecraft engaged in practical applications and uses of space technology such as weather or communication (US Cat C). Positioned in geosynchronous orbit at 15 deg W in 1984-1992 As of 3 September 2001 located at 170.37 deg W drifting at 6.220 deg W per day. As of 2007 Mar 10 located at 100.08W drifting at 6.233W degrees per day. Syncom IV-3 - . Payload: Discovery F4 / Anik C1 [PAM-D] / Syncom-4 3 [Orbus. Mass: 1,315 kg (2,899 lb). Nation: USA. Agency: HCI. Class: Communications. Type: Civilian communications satellite. Spacecraft: HS 381. Completed Operations Date: 1996-09-30 . USAF Sat Cat: 15643 . COSPAR: 1985-028C. Apogee: 37,080 km (23,040 mi). Perigee: 36,401 km (22,618 mi). Inclination: 14.40 deg. Period: 1,485.10 min. Released by STS 51D 4/13/85; failed to orbit and subsequently repaired by STS 51-I on 8/31/85; 178 deg E; leased by U.S. government. Spacecraft engaged in practical applications and uses of space technology such as weather or communication (US Cat C). Positioned in geosynchronous orbit at 175 deg W in 1985-1987; 105 deg W in 1987-1996 As of 31 August 2001 located at 106.85 deg E drifting at 11.920 deg W per day. As of 2007 Mar 10 located at 158.41W drifting at 11.917W degrees per day. Syncom IV-4 - . Payload: Discovery F6 / Syncom-4 4 [Orbus-7S] / Aussat A1 [. Mass: 1,388 kg (3,060 lb). Nation: USA. Agency: HCI. Class: Communications. Type: Civilian communications satellite. Spacecraft: HS 381. Completed Operations Date: 1996-10-30 . USAF Sat Cat: 15995 . COSPAR: 1985-076D. Apogee: 36,503 km (22,681 mi). Perigee: 36,486 km (22,671 mi). Inclination: 9.50 deg. Period: 1,472.40 min. Released by STS 51I 8/29/85; 178 deg E; leased by U.S. government. Spacecraft engaged in practical applications and uses of space technology such as weather or communication (US Cat C). Positioned in geosynchronous orbit at 177 deg W in 1985-1987 As of 3 September 2001 located at 149.81 deg W drifting at 8.908 deg W per day. As of 2007 Mar 10 located at 84.34W drifting at 8.912W degrees per day.